All level 2 TPA members receive free access to John Yandell's Tennisplayer.net (value of $100/year). This world leading tennis magazine offers hundreds of coaching resources in the form of videos, articles and interviews. Level 1 members can take advantage of the new partnership and its many benefits by upgrading their TPA membership for only $35. To do so, please click the button below. 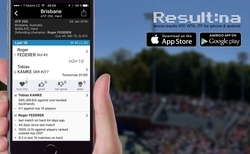 The TPA is proud to announce a new partnership with Resultina to offer our level 2 members free access to their app, which delivers results of the players you are interested in. It covers ATP, WTA, ITF, Juniors, Tennis Europe U16, U14 and U12, both singles and doubles! During the 2010 Rogers Cup presented by National Bank in Toronto, Tennis Canada announced a partnership between the Tennis Professionals Association (TPA) and Professional Tennis Registry (PTR) that took effect in January 2011. This partnership provides TPA level 2 members with an array of benefits, including subscriptions to TennisPro, TennisOne, access to PTR educational events, symposiums, and additional seminars that will be run within Canada. The PTR was founded in 1976 and is the largest global organization of tennis teachers and coaches with more than 14,500 members throughout 122 countries. The PTR’s mandate is to educate, certify and service tennis teachers and coaches around the world in order to grow the game of tennis. The PTR membership offers unparalleled educational materials, opportunities, career assistance and worldwide recognition and respect. Level 2 TPA Members also receive free access to Tennis Pro magazine, which is published bi-monthly by the PTR. In every issue, there are news articles from the industry, Tennis Pro members and from around the world. For more information and access to Tennis Pro Magazine click here. Every Level 2 member can now also access a free online presentation from the PTR Tennis Symposium. This year's presentation was done by David Benzel who is an internationally recognized speaker.